With spring training underway throughout Florida and Arizona, new Major League Baseball Commissioner Rob Manfred made a major announcement yesterday. After more than a century of the World Series featuring one team from the National League and one team from the American League, the Commissioner revealed a change in the playoff format effective for the 2015 season, so that teams from the same league could potentially meet in the World Series. Manfred said, "We want the best teams to compete for the World Series and revising the playoff format will help accomplish this goal. Seeing a Red Sox-Yankees or a Dodgers-Giants World Series would be amazing. Think of the ratings!" 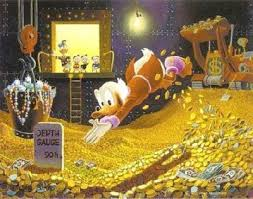 There were unconfirmed reports that Manfred then jumped into a Scrooge McDuck money pit. Cubs (96) vs. Red Sox (98) - Now this would be a fun series! Of course, there's always a chance that things could backfire. Instead of having the teams with the two best records, you could have a Cubs-Miami World Series. Do you listen to songs on the radio and think to yourself, I would love to know Sean's thoughts about various lyrics? 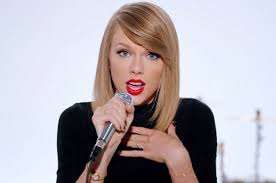 Well, I'm back again to analyze lyrics from some of the biggest current pop songs. McCartney is one of the greatest songwriters ever. However, this is just a fancy way of staying that it's Tuesday. So, you have 6 more days to get home and you're singing about this now? Can you at least wait until Friday to start telling everyone that you need to be home by Monday? Even The Wallflowers had one headlight. Taylor, this guy is a terrible driver. Stay away! Usher, you're 36 years old and have two kids. Why are you singing a song like this? Click here for previous installments of me analyzing song lyrics. See what I did there? I combined Trivia Tuesday with a Friday Video. With the Academy Awards taking place on Sunday, can you name the only music video that features two Oscar-winning actors, two Grammy award winners and Mr. T? If you looked down the screen, you obviously know the answer. I recently discovered an unopened bag of Rold Gold pretzels in my basement closet. (Yes, this truly is a "Found in My Basement" blog post!) My excitement in finding my favorite snack food was tempered by the fact that the bag shows a use by date of June 2014. 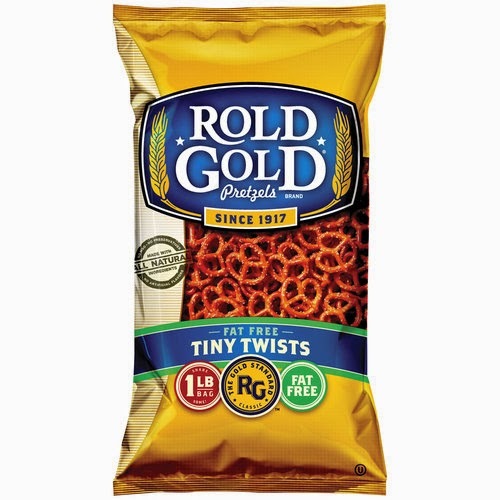 While I don't use milk or eggs beyond the expiration date (well, maybe one or two days after the date if the milk smells okay), would an unopened bag of pretzels be stale or unsafe to eat 8 months after the expiration date? There was an article in Sunday's Washington Post about the teams with the best odds to win the 2015 World Series. The print version includes the over/under wins for each MLB team from Bovada and the World Series odds from the Atlantis sportsbook. Since this is the Washington Post, the Nationals were clearly the focus of the article as the team has the best odds to win the World Series (13-2) and are expected to have the most regular season wins (over/under 93). The odd part, though, is how these sites view the Pirates. Bovada has the Pirates over/under wins at 85 1/2. After reaching the playoffs over the past two seasons, this is not unexpected. In fact the 85 1/2 is the 7th best in baseball behind the Nats, Dodgers, Cardinals, Angels, Tigers and Red Sox. However, Atlantis has the Pirates odds to win the World Series at 33-1 or tied for 17th best in baseball. Um, what? Look, I understand that the Nationals, Dodgers, and Cardinals all look like more complete teams and will be extremely tough competition for the Pirates. Meanwhile, the Mets (28-1), Mariners (16-1), Cubs (10-1!) and Padres (14-1) all have better odds to win the World Series than the Bucs. I visited Israel during winter break of 1996/the first day or two of 1997. It was an amazing trip. I was part of the leadership bus consisting of college students throughout the country. Most of the people on the bus didn't know more than a few others, so there weren't the cliques that you might expect. I became friends with a couple from the University of Houston and went to their wedding a few years later. My assigned roommate attended Texas A&M, and I remember him trying to bargain for cheaper ice cream at Ben & Jerry's since you're expected to bargain at retail stores in Israel. Obviously, this did not apply at Ben & Jerry's but the interaction between my roommate and the employee was hilarious. I made friends with people from George Mason University, Arizona State University and San Diego State, and in this last case, she vouched me, helping me get a job there. Unfortunately, I lost all of my pictures from this trip. I don't know if I accidentally threw them away packing up after college graduation, but they have been gone for 18+ years now. However, I recently found a newsletter that included this picture of me with the current Israeli Prime Minister and the leader at the time, Benjamin Netanyahu. I honestly don't know why I was picked to meet Netanyahu, and more importantly, why the Prime Minister took time out of his schedule to address a group (though a large group) of American college students. I think I probably said hello, but I doubt we said more than ten words to each other. I'm positive that I was much nicer to Netanyahu than I was to former California Governor Gray Davis. Netanyahu is in the news quite a bit these days. He's currently running for re-election in Israel and may or may not address Congress in the near future. Whether or not you agree or disagree with any (or all) of Netanyahu's opinions and policies, how often can you say that you shook hands with a country leader? I mean, sure I got a holiday card from the Gore family, but Al Gore was only the Vice President at that time, and it's not like we actually met. 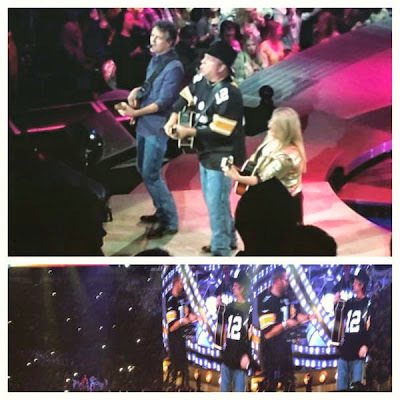 Country star Garth Brooks recently played 713 concerts in Pittsburgh* and in various performances wore Steelers, Penguins and Pirates jerseys. 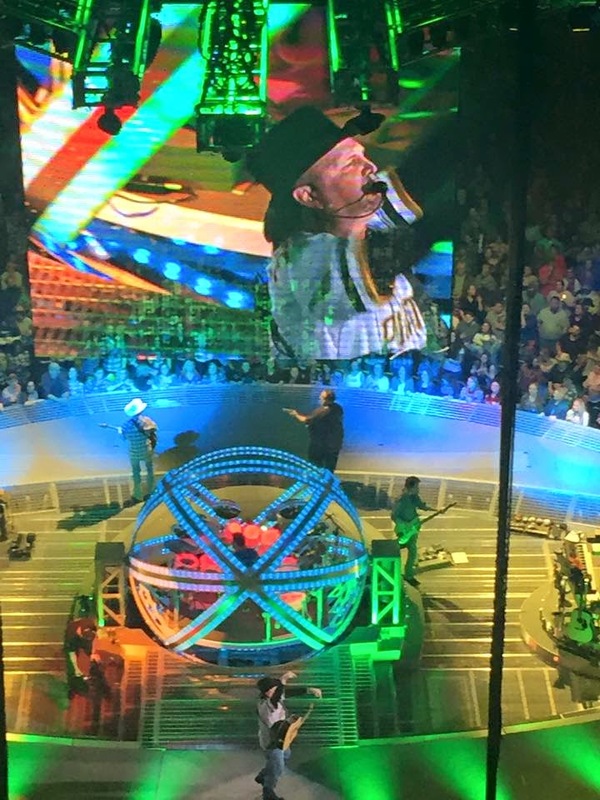 Brooks showed that he either really, really likes the Pittsburgh sports teams or he's just pandering to the crowd. I'm fine with either (though I hope it's the first one). If only he wore a Pittsburgh Spirit or Pittsburgh Maulers jersey. Anyway, here's proof of Brooks wearing jerseys including a video showing Steelers Coach Mike Tomlin ("a huge Garth Brooks fan") and Hall of Famers Mel Blount & Lynn Swann singing Brooks a Happy Birthday. * This number may be incorrect. 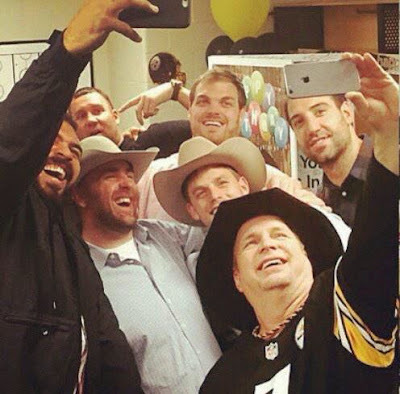 Photos from Y108 & Cam Heyward's wife. On Sunday afternoon, at 4:12 PM in Arlington, Virginia, I turned on the car radio and pressed scan on the FM dial. I arrived at my destination at 4:26 PM. The radio scanned the entire 14 minutes, and despite stopping on probably 20 stations several hundred times collectively, I did not hear one Taylor Swift song. I'll let Washington Wizards announcer Steve Buckhantz call this historic moment. I sincerely did not think it was possible to go more than 5 minutes in a metropolitan area without hearing a Taylor Swift song. The next time you're driving, I challenge you to try to match this achievement. 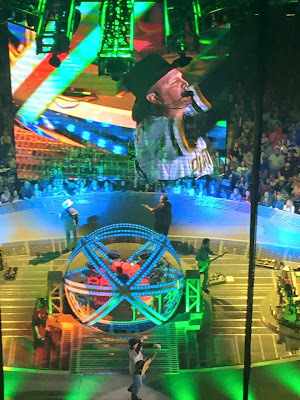 This is a guest post from blogger Mark Stevens who (I believe) is no relation to former Pittsburgh Penguin Kevin Stevens or Shadoe Stevens. I'm really dating myself with these references. Hair can define a person, for better or worse. Athletes who are constantly in the spotlight can have their hair become a major topic of discussion not only at the game, but on the internet. Here is one player from every major professional sport who is making headlines with what’s on top of their head. 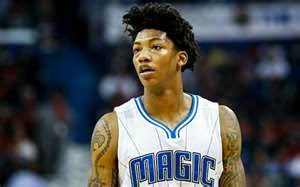 The rookie point guard for the Orlando Magic has been having a pretty solid year. Even though the team is not winning consistently, he looks like a guy who could be a major factor for them in the upcoming years. Most people know him as the guy with the weird haircut. 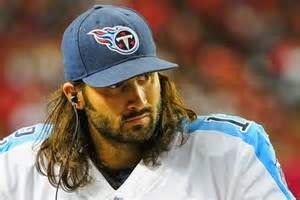 There is really nobody in professional sports with a haircut like him, and therefore it really does not have a name. It first grew his hair out with the rest of his high school teammates, and now he just goes with it. 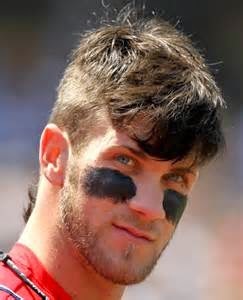 One of baseball’s most promising youngsters has been known to mess around with hair styles. When he grows it out and goes with some sort of a faux hawk, it doesn’t exactly win a lot of style points. Maybe it helps with his own brand, but the hair hasn’t helped him shake the reputation of being a bit of a prima donna. When your nickname is Clipboard Jesus, it isn’t exactly flattering. The lifelong backup received some playing time for the Tennessee Titans this year, and almost instantly people were cracking jokes on how he looks. As you would expect, his long hair and facial hair makes him look like common depictions of Jesus. The veteran left winger has cleaned up his hair from time to time, but when he lets it grow out, he has a carrot top afro with a matching beard. 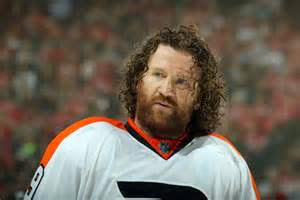 There are actually a lot of hockey players with pretty nice hair out there, but Hartnell is one who just lets it do its own thing. Now that he is 32 years of age, perhaps his crazy hair days are a thing of the past. If you haven’t yet checked out Daily Fantasy Sports, we’re offering a 100% deposit bonus on your first deposit for Sean’s Ramblings readers. Click here to get started today with your FanDuel promo code. - One of the first articles is titled "Got Mom Guilt? Shake It Off!" The idea is that "there are better ways to make the most of your mom time." If you have a spare 45 minutes, "you can plan to check in with the teacher about your child's current reading level, or you can plan your family's next long-weekend vacay adventure." This is an excellent point. Why bother with your child's reading ability? It's not like he/she will need to read in life. - Mom guilt isn't really applicable to me, so how about sleep traps. The magazine states that "you want to put your infant in his crib before he gets too sleepy, so that he learns to connect going to sleep with being in his crib, not in your arms." My 9-month old crashes while taking his last bottle EVERY SINGLE NIGHT. So this is bad, Parents Magazine? - While I'm really not sure what lip color is for me, I'm guessing that it's not Isla Fisher's purple. - Did you know that "39% of adults spend more than 11 hours outside of work using electronic media each day," according to Northwestern University? I wondered how this is even possible but the article continues that playing Candy Crush while watching TV counts as double. How did the article know that I'm watching TV, typing this blog post, and playing both Trivia Crack and Xbox at the same time? 1. Apply mascara to top lashes only. Done. 2. Dab a dewy balm on you lids. Um, what is a dewy balm? 3. Use the "starburst method of applying mascara. Is there any other way? 4. Know where your brow arch should be. I think this was the original version of a Whitney Houston song. 5. Never underestimate the power of curled lashes and groomed, filled-in brows. DO NOT UNDERESTIMATE THIS POWER! 6. Apply luminizer under your concealer. The Luminizer. Coming to theaters this May. - "By just 6 months, your baby can see 20/30, or in other words, almost as well as you." That's really cute. My vision hasn't been 20/30 since elementary school. That was fun. There are actually a few useful articles, so as long as I don't get billed, I'm certainly happy to continue to peruse Parents Magazine. Happy Tuesday everyone! Let's get right to the trivia today. Your challenge is to answer the questions based on the pictures below. As always, do not use the internet for assistance, and leave your answers in the comments section below. Good luck!